Main -> Attractions -> Panorama "Borodino Battle"
The museum building was constructed at the historic place. Here had once been the village of Fili (suburb of Moscow) where on September 13, 1812, in a wooden log hut belonging to a peasant (Frolov by name), the council of war was held, and the fate not only of Moscow but also of entire Russia was at stake. Since then this house which was named "Kutuzov's hut" by people became the historical relic. In front of it one can see a bronze bust of M.I.Kutuzov. Nearby there is a building of the former museum-chapel of Kutuzov that was built in commemoration of the Centennial of the Patriotic War, as well as an obelisk marking the common grave of 300 Russian warriors. Not far from our museum, on the Kutuzov Avenue, there is the Arc of Triumph erected in 1834. It was restored next to the Poklonnaya Gora (Hill of Respectful Salutation) where Napoleon had vainly expected to be met by a deputation of the city elders, bearing the municipal keys. 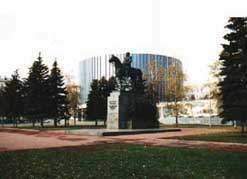 In 1973 a huge monument heroes of the War of 1812 was erected in front of the museum, topped with an equestrian statue of Kutuzov. So, the above mentioned monuments composed single historical-memorial complex dedicated to the glory of Rusia in battles. The focal point of this complea is the Panorama-Museum. First, museum was intended for demonstration of the only exponent. That is panorama "The Battle of Borodino", created in 1912 by Franz Roubaut, academician of painting (1856, Odessa - 1928, Munich). This outstanding masterpiece of battle-painting can be rightfully called a monument to the feat of arms accomplished by Russian warriors who had wiped out the invaders and liberated their Homeland. Gradually, a vast collection of different materials had been gathered. And nowadays' exposition represent the prehistory of the war, the course of campaign of 1812, from the very beginning of hostilities up to the collapse of Napoleonic army. The genuine works of painting, drawing, sculpture created both by the contemporaries of the war and artists belonging to the later period, as well as uniforms, banners, weapons recount the past, reflect the heroism of the Russian army and people. Rich funds make it possible, apart from constant exposition, to organize temporary exibitions. But the panorama remains the main exponent. A huge canvas (115 m x 15 m) presents the height of battle on the field of Borodino (The French called it "Moscow battle").